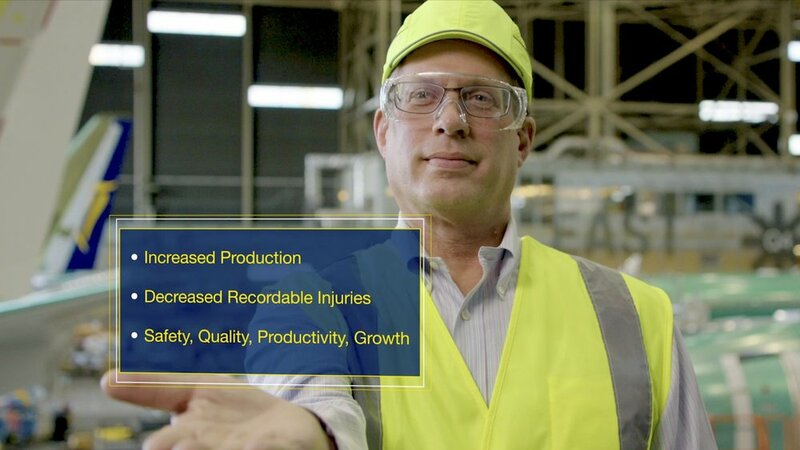 Safety in the Workplace Video Gets Worldwide Release — Goalen Group INC. Since 2013, Boeing has made a serious re-commitment to improving workplace safety and the commitment started at the top with the Chairman’s office. As the world’s largest aerospace company and America’s largest exporter – assembles commercial airplanes and defense products and also builds aerospace components in the United States that is a tall order. Among Boeing’s 140,000 employees in all 50 states are more than 50,000 factory employees and more than 45,000 engineers. The goal for employee safety is clear and simple as our workplace safety program’s name: Go for Zero – One Day at a Time. The program’s aim is to achieve this goal day by day by eliminating all workplace injuries and ensuring an environment where all employees go home in the same shape as when they came to work. As part of the program, the Chairman’s Safety Recognition Program was also created to highlight achievements in workplace safety throughout the year. The event includes day long sessions and seminars on safety replication and a recognition dinner hosted by Chairman Dennis Muilenburg and top company executives. With the goal of wanting to show that safety is a long-term ongoing process, we decided to include a bit of history on the company’s on-going efforts over the years. Needless to say, the story of workplace safety over the last 100 years is an interesting one. For the original videography, we used a terrific local Seattle crew. It is crucial to use an experienced crew when shooting on a Boeing facility, especially on the production line of a multi-million dollar product. Logistics are critical for getting crew and equipment on to the facilities without disruption. Added to that was making sure that all employees within the frame were following all safety rules. The client provided us safety experts that kept us on track. They also made sure WE didn’t break any safety rules while shooting. We premiered the video at the recognition dinner which included projecting safety graphics on the ceiling. Today the video was released worldwide on the website. It was great to be part of such a successful program that is helping employees live better lives and is showing that safety is good business. And Boeing is not just promoting safety in its’ own workplace. It is reaching out to all their thousands of suppliers around the world to embrace the safety culture. It is just good business for everybody!